A powerful 6.5 earthquake hit the western Indonesian island of Sumatra on Thursday. The epicenter of the quake was about 40km (25 miles) from the coast, according to the US Geological Survey. Padang, the largest city on the island’s western coast, is located some 141 kilometers (87.6 miles) from the epicenter of the earthquake, according to USGS. It is home to about 1 million people. The city closest to the epicenter is Sungai Penuh, some 91 kilometers (56.5 miles) from the epicenter, with a population of 90,000. Tremors were reportedly felt as far away as in Singapore, located some 531 kilometers (330 miles) from the quake. Some Singapore residents tweeted they felt the ground shake. Felt a small earthquake in Singapore this morning. Didn't know if I was dreaming but USGS confirms quake off Sumatra, Indonesia. At least 7 reports of tremors have come in from Singapore, Channel NewsAsia reported. Strong temblors were reportedly felt in Mukomuko, a town on the west coast of Sumatra. The shaking lasted for at least a minute and forced residents out of their houses. “When the earthquake struck, we quickly brought the kids out of the house; we are concerned that this earthquake might knock the houses down,” said an eyewitness, as cited by ANTARA News. American/international press says "tremors in Indonesia. Earthquake warning"
Meteorologists announced there was no immediate tsunami threat. “The earthquake centered 79 kilometers southwest of the South Coast, no tsunami potential,” said the head of Panjang’s Meteorology, Climatology, and Geophysics Agency (BMKG) Geophysics Station, as cited by the Republika.co.id news site. — TODAY (@TODAYonline) 2 июня 2016 г.
Reuters cited another witness on Sumatra who described the panic in the aftermath of the quake, saying that people had rushed out into the streets, but then returned to their houses. The tremors were felt just before dawn and lasted for half a minute, the report said. No reports of any damage or casualties were immediately available. 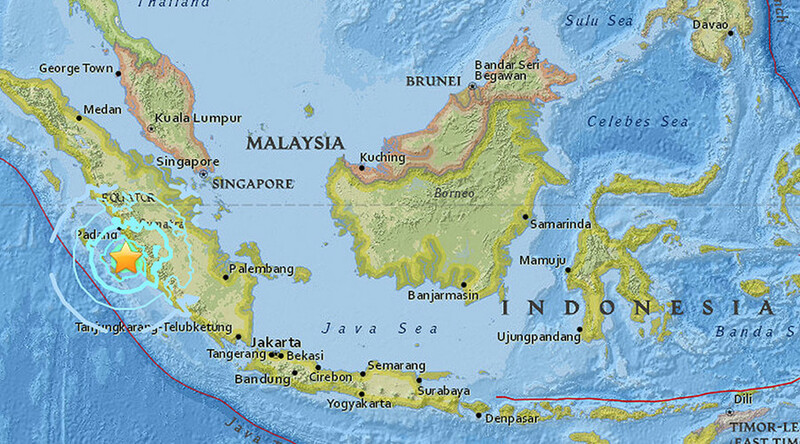 Indonesia is located in the seismically violent region known as the Pacific Ring of Fire. The latest major earthquake to affect the country took place in December of 2004. The devastating 9.15-magnitude quake that triggered 17-meter-high tsunami waves took lives of some 168,000 people in northwestern Sumatra alone.